With bikeshare coming next year to downtown Los Angeles, I took a page from our previous transit tourist posts on a recent visit to Chicago and spent some time reviewing the Windy City’s bikeshare system. Divvy bike at North Avenue Beach in Chicago, Ill. Photo by Joseph Lemon/Metro. Chicago’s bikeshare program is called Divvy. It began operating in the fall of 2013 and is the second largest bikeshare system in the U.S.
It’s operated by Motivate — formerly Alta Bicycle Share. The company is also the operator of high-profile bikeshares such as CitiBike in New York City, Bay Area Bike Share in San Francisco and Capital Bikeshare in Washington D.C., among others. Chicago’s bike network is fairly expansive and hosts a diverse network of bike lanes, bike trails and barrier and buffer protected bike lanes. In total, the city claims 200 miles of bike lanes. A special draw for tourists during the summer is the Lakefront Trail that runs 18.5 miles along the Lake Michigan shorefront, stretching from the city’s northern neighborhoods to Navy Pier in downtown and The Loop. In fact, it was this trail that piqued my interest in using the Chicago bikeshare during my visit. The 24 hours of unlimited rides were really just an added bonus. Chicago’s Divvy bikeshare system is home to 4,700 bikes and 476 stations throughout most of the city. The bikes are available to use year-round, 24 hours a day. A look at the map above shows how widely available the bikes are throughout the core of the city. The cost for a 24-hour pass is $9.95 and an annual membership is $75. The passes allow for unlimited 30-minute rides within the allotted time period. An additional half hour costs $2.00 with a 24-hour pass or $1.50 with the annual membership. A 60 to 90 minute trip costs $6.00 or $4.50 and trips over 90 minutes cost $8.00 or $6.00 for each additional half hour — again, it’s always less expensive for those with annual memberships. The payment kiosk at a Divvy bikeshare station. Because the annual membership passes are only available for purchase online, I’ll be focusing on the 24 hour pass because it’s what I used during my visit. During the initial purchase, I was given the option to purchase one or two 24-hour passes, which turned out to be especially convenient for me since two passes is exactly what I needed for my girlfriend and I. Unlike Metro’s future bikeshare, which hopes to include allow payment with a TAP card, Divvy doesn’t accept transit fare cards. However, it does accept both credit or debit cards and the machines had little issue reading my card. There is a way to pay with cash, but it’s part of a special program and not available at the bike stations. Once payment was confirmed and I agreed to the terms and conditions — namely accepting liability for losing a bike — two five-digit bike unlock codes were generated on the screen and a receipt was printed with the codes. Unlocking the bikes was as simple typing in the code next to the front wheel of the bike and waiting for the small light to turn green. The process was much the same for additional rides after the initial checkout. To get new unlock codes, I simply pressed the touch screen, selected the option to print additional unlock codes and swiped the credit card I used for the initial payment. 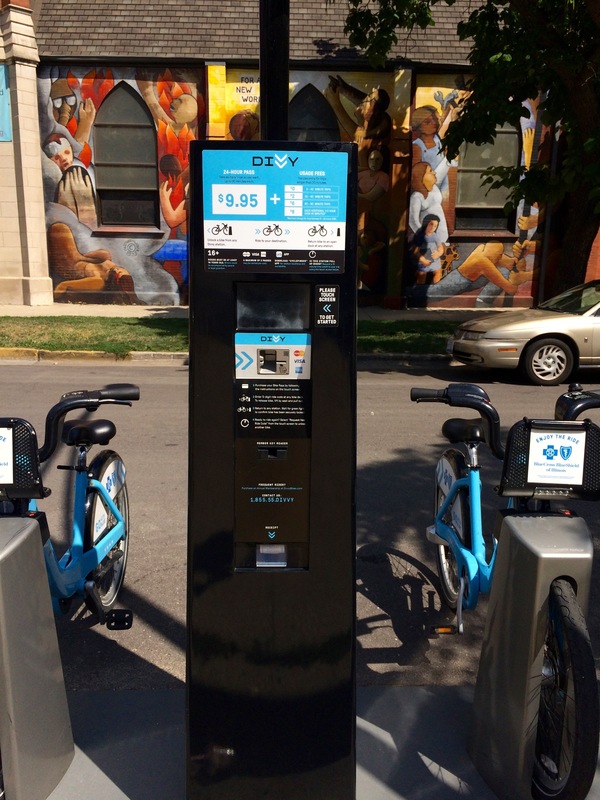 A full Divvy bike station in the Boystown neighborhood in Chicago. The Divvy bikes are clearly made to be durable and withstand some abuse. So naturally, they’re much heavier than a standard bike. 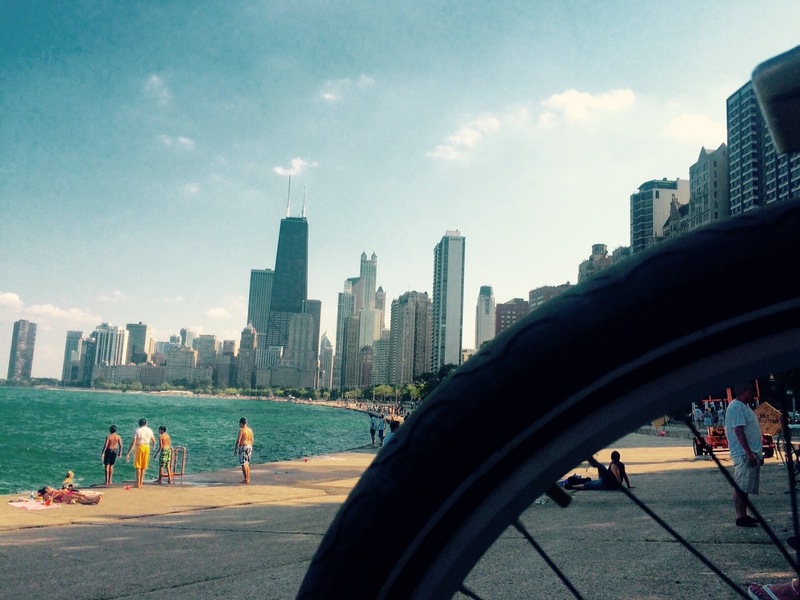 The bikes have three speeds, giving them just enough flexibility to ride in Chicago’s relatively flat terrain. As you’d expect, the bike seats are adjustable though they took some strenuous wriggling to set at the right level. The bikes also have a convenient front-facing rack with a bungee cord to hold bags or accessories. Divvy offers a smartphone app called BikeFinder. Apparently there’s signage for it along the system, but I had only searched for “Divvy” in the App Store and therefore I resorted to using the bike map on Divvy’s mobile website. The app’s features — a bike map and a manually set ride timer — are basic compared to other options out there. Had I done some research prior to my trip, Divvy’s website lists a handful of third-party apps that use its data for features including real-time directions to bike stations, something that would’ve been exceptionally useful. Bike station map at Wabash Ave & Adams St in downtown Chicago. The original trip idea was to use the bikeshare to travel down the Lakefront Trail. My girlfriend and I opted to use bikeshare instead of a typical rental bike service because of the flexibility bikeshare offers that a renting a bike wouldn’t. The most significant is the flexibility to pick up and drop off a bike virtually anywhere in the city. And even though we hadn’t planned on using the bikes for more than the initial ride along the Lake, the Divvy network proved to be a convenient option in a handful of other situations during the 24-hour rental period. Divvy riders. Photo by John Greenfield via Flickr Creative Commons. Because my girlfriend hadn’t ridden a bike in more than a decade — gasp! — we started out slow near the Chicago History Museum in Lincoln Park, an area that wasn’t as crowded as the Lakefront Trail was likely to be on a muggy summer afternoon. After building up some confidence, we made our way to the lakefront and biked down the crowded lake path for about a half hour. Eventually we found the nearest kiosk and returned the bikes. One thing that took a little getting used to was the force needed to unlock and lock the bikes when checking out or returning. I assume this is one reason why the bikes are made sturdy. Unlocking took a lot of muscle and securing the bike back felt like I was pushing a battering ram. Before we learned to slam the bike into the bike rack with nearly as much force we could muster, we nearly walked away with a bike left unsecured. The next time we learned to watch the yellow and green lights next to the bike rack to indicate the bike was secure. Over the next 24 hours, bicycling became a part of our tourist travel repertoire. We used it mostly for shorter trips where we could use bike lanes for the majority of the ride, like getting breakfast in River North, riding through the quieter West Loop neighborhoods on our way to grab a post-dinner drink and cruising the Loop to Millennium Park. Divvy riders. Photo by Steven Vance via Flickr Creative Commons. All the while Google Maps blurted muffled directions from the smartphone stuffed in my pants pocket. It wasn’t ideal, but I usually plotted our trips on the maps beforehand so the absence of built-in way-finding wasn’t that huge of an inconvenience. It also helps that Chicago is a fairly easy place to get around. We never ran into problems with the number of bikes at the kiosks –– there were always either bikes available to be taken or space to leave bikes. The smartphone app and the mobile map give real-time bike counts at each station so users can get this info before going to a station. Divvy says they use trucks to move bikes around and balance the amount of bikes available throughout the city. Truthfully, my Divvy bikeshare experience was nearly perfect. The few things I’ve nitpicked such as heavy bikes, no transit fares and clumsy way-finding were only minor inconveniences and didn’t take much away from the ease of using the system. Having the option of a 24-hour pass was key to be able to use Divvy essentially carefree throughout the 24 hour span. I can’t imagine I would’ve used it much if I had to pay for each trip. My experience also highlighted the potential for bikeshare to introduce people to the concept of biking in an urban setting if the set-up is easy and the infrastructure is in place to make casual riders feel safe. • Create an easy-to-find and use app with built-in way-finding. Divvy missed an opportunity with their smartphone app. Yes, much of the data I needed was available in third-party apps, but if I’m a casual bikeshare user or tourist (which I was), I might not know of the third-party apps listed on their website. Once you’ve created a branded app, using geolocation with the app to provide information about nearby bike stations or integrating Google Maps for trip routing is not only a timesaver, but it also gives users the perception they’re part of a cohesively functioning network. It’s about convenience and peace of mind. Divvy bikes in winter. Inclement weather is one obstacle L.A.’s bikeshare program won’t need to overcome. Photo by Andrew Seaman via Flickr Creative Commons. Joe is on Twitter @joseph_lem. Follow him for other insights on transit, tech, sports and living car-free. It seems that the credit card readers for these bikeshare kiosks are still relying on mag-stripes instead of the EMV security chip that the banks are issuing these days. So my main concern is how safe are these bikeshare credit card readers from magnetic stripe skimmers? Come October, due to the mandatory EMV switchover, the financial liability of fraud goes to whomever has the least security and usually, that means the vendors and retailers who still use mag-stripe swipers for credit cards. The last thing I want is taxpayers being on the hook for credit card fraud because the government agency who installed these kiosks didn’t pay attention to the EMV switchover and went the cheap route by sticking with the plain old magnetic stripe reader. Thanks for this review. Helps us Angelenos view the future. Hopefully as the LA system expands and the redevelopement along the river continues, the ride along the LA River will be a draw. It would be cool to see a dozen locations along the river have bike sharing (like Griffith Park, Sepulveda Recreation area, down by the Cornfield, etc.) Having a bike station at the Green/Crenshaw Aviation station and a couple in the Dockweiler and Marina Del Rey areas would be great. The credit card skimming and EMV liability shift is definitely something to think about. Does Metro themselves have any plans to upgrade their TVMs to start accepting chipped credit cards instead of magnetic stripes? If going by what Europe once went through when they did their EMV conversion many years ago, criminals usually go after those who lag behind in security upgrades. Really enjoyed this article. Thanks for the info. Seeing all of these great bike facilities in other American cities is at both times encouraging and disappointing for Los Angeles. At least this gives us good talking points when we discuss LA biking with cynics who say “We’re not Copenhagen here”. While we may not be Copenhagen, we can certainly strive to be better than Chicago, New York and Washington! I can just as easily say LA does not share any similar characteristics as Chicago, New York, or Washington either. So just as equally, anyone can also cite examples like Beijing, Shanghai, and Hong Kong as well.